I’ve been in self-imposed blog exile for the last couple of months. A combination of running a small part of an election campaign, two trips to the US for work, participation in an amazing action learning process hosted by the Common Cause team and a number of other commitments have meant that I haven’t been able to blog. 1. Avaaz 2.0 – The global campaigning movement has launched a platform for its own members to develop and run their own actions. It’s still in beta mode at the moment but I’m sure that will change in the coming months. Also Change.org has launched its own UK platform with some great coverage. I’ve written before about how I really like the model that Change.org uses providing campaign organisers to help increase the impact of online petitions created by members. I hope that both will be successful. 2. Right Angle – The platform aims to be ‘a grassroots community. We exist to stand up for ordinary families – Britain’s silent majority’ and is supported by a number of Conservative MPs. So far, they’ve not had the same impact that 38 Degrees had in their first few month, although they were able to generate over 100,000 people to join their Facebook campaign against cutting fuel duty, so it’ll be interesting to see how the grow over the summer. 3. Twitter – It’s been great to see organisations engage with twitter in more and more innovative ways, two particularly impressed me. The Twobby of Parliament by members of the Care and Support Alliance, and the development of this tool by ONE which allows users to send messages to David Cameron on food security. 4. People’s Pledge – This sneaked under the radar , but I think the ability of an organisation to mobilise 14,000+ people in a constituency to vote for a local referendum on membership of the European Union is an impressive feat. With the introduction of the Localism bill, I wonder if we’re going to see more of this community level campaigning that leads to local ballots on issues. 5. 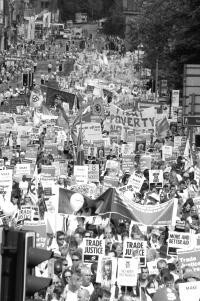 The next Make Poverty History – It was confirmed that development organisations are coming together to launch another ‘Make Poverty History’ style campaign in 2013. I’m sure this will be huge in the next 12 months, and I’m hoping that all those involved read this about lessons learnt and ensure that the next campaign is designed to avoid them. 6. KONY 2012 – I wrote before my blogging break about why the video had such a phenomenal response when it was first released, however the campaign wasn’t able to sustain the initial interest with the ‘Cover the Night’ event in late April failing to take off in the way they’d originally hoped. 7. US Election – Lots more great articles about different techniques and tools being employed in the campaign. I’d highly recommend every campaigner keeps an eye on the articles by Sasha Issenberg over at Slate, which I’ve found to be the most insightful into the approaches the campaigns are taking. Life is returning to normality, so I plan to write some more on these topics and others in the coming weeks, as well as share the initial results I’m getting in government departments about the number of actions they’ve received in the last 12 months.